From the first day of the year 2020, all aircraft are obliged to send out their navigated position via a system called ADS-B (Automatic Dependent Surveillance–Broadcast). This system combines three functions, which were previously separated: Communication, Navigation & Surveillance, CNS in short. This system has the potential to radically change Air Traffic Management (ATM) as we know it. How it would do this is an example of a topic which is being studied by the chair CNS/ATM at the Control & Simulation section. ADS-B allows, for example, the use of traffic information in the cockpit, and thereby de-centralizing air traffic control. How would such a distributed system behave? Would it be safe and efficient? The chair has as focus: studying systems that can help air traffic control, but also the aspect of looking at air transport not through the perspective of individual aircraft, but as a complex system with inter-acting aircraft, which together form flows, with specific dynamics. These dynamics are very different for a sector or airport with airliners or for unmanned aerial systems (which might use swarming) or high volumes of personal air transport systems. 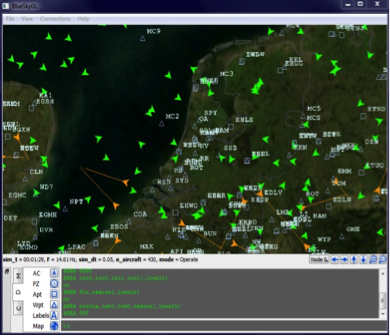 The CNS/ATM chair uses methodologies such as big data analysis and traffic simulations, often in combination with the BlueSky open ATM Simulator (downloadable from Github for everyone). We have our own source of traffic data using our ADS-B receiver on top of the roof of our building. By feeding our data to the FlightRadar24 network we also have access to global traffic data, which we use to study the air transport system. Our projects utilises the open data, open source philosophy as much as possible. Results of both master and PhD often contribute to international and national projects. We co-operate with Eurocontrol, the LVNL, KLM, DLR , NLR and many universities across the world. Scientific foundation of ATM: increasing our understanding of the complex air transport system. What is the predictability of a trajectory or a traffic flow?